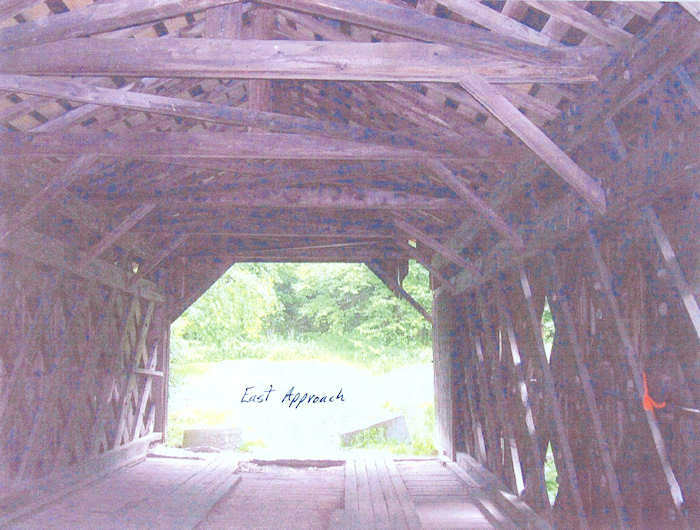 The Agency of Transportation and the Town of Montgomery desire a long-term solution for the preservation of the historic Creamery West Hill Covered Bridge on T.R. 25. The bridge is located on T.R. 25 approximately 0.2 miles west of its junction with T.R. 12. T.R. 25 is a Class 4 town highway that connects T.R. 55 and T.R. 12. See the attached location map. The single span bridge crossing the West Rill Brook is 17'-9" wide centerline to centerline of trusses and has an approximate load-bearing length of 44 feet, with an overall length of about 58.5 feet. Portions of the timber elements are in poor condition and require rehabilitation or replacement. The dry laid abutment on the west end of the bridge is in fair condition. The project is funded as an earmark through project BRO 1448(). This program allows the State to fund up to ninety five percent (95%) of the cost necessary to rehabilitate the bridge. There are no original plans of the existing bridge, but it is generally believed to have been constructed circa 1883. The covered bridge is comprised of plank lattice trusses. The trusses extend beyond their bearings, especially at the east end of the bridge. Traffic loads are supported by a floor system consisting of wood floor beams with a multilayer plank deck. This floor system was designed for an unknown truck (AASRTO loading) although the bridge opening prohibits access for some vehicle configurations. Therefore, large vehicles that cannot accommodate the bridge opening (8' -2" minimum vertical clearance at the bottom of the transverse knee braces) must cross the brook elsewhere. 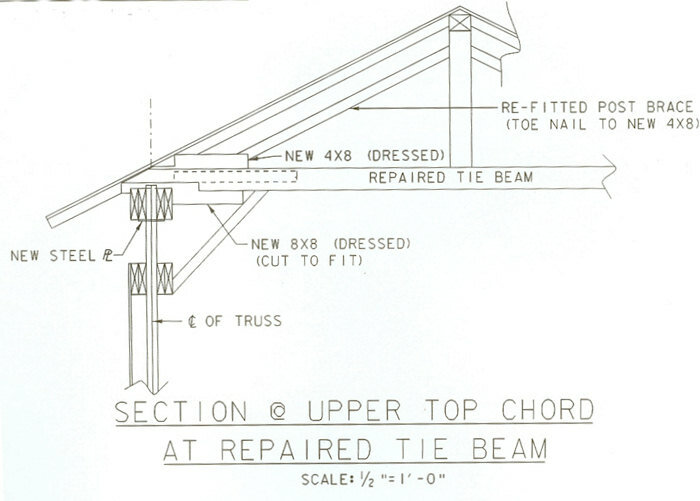 The roof system and upper framing system are in fair condition with the exception of localized rot and impact damage to some of the upper bracing members and two tie beams. The trusses are in fair to poor condition. There is a missing lamination in the upper bottom chord of the upstream truss and a failed lower chord lamination in the downstream truss. 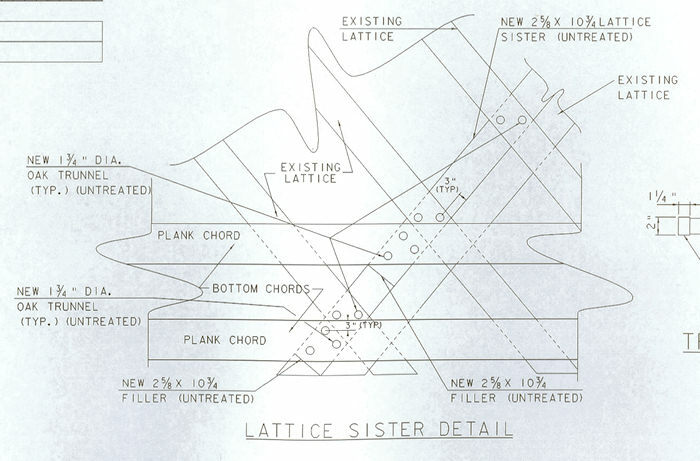 There is at least one truss lattice that requires sistering. The floor system is in poor condition with missing and rotted planks and a mismatched (and somewhat disconnected - west end) floor beam support system. The abutments are in fair to poor condition. The east abutment demonstrates need for concrete repairs and the northeast stone wing has failed completely, requiring reconstruction. The west abutment requires extensive areas of new stone masonry wing construction and existing stone masonry re-pointing. 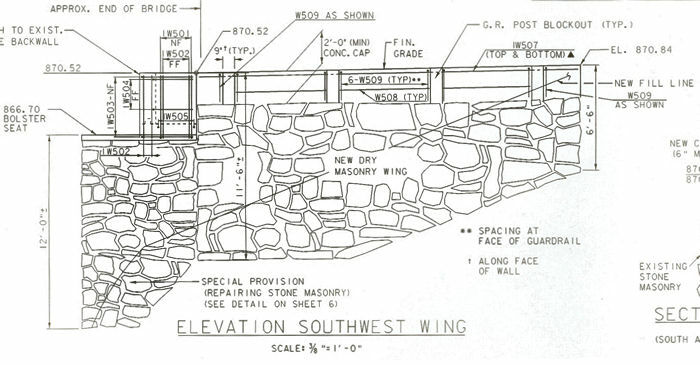 Also, portions of the stone abutment backwall require rebuilding and the west abutment itself requires new bolster beam seats. The bridge is presently closed with traffic maintained on alternate town highway routes. To rehabilitate the covered bridge and construct the abutment wings the bridge must remain closed to traffic. The project must consider the environmental, historical, and archaeological resources within the project and its immediate surroundings. The West Hill Brook flows south to north under the bridge and is considered a cold water fishery, so care should be taken to avoid sediment discharges. From an environmental resource perspective, the Vermont Department of Fish and Wildlife will probably require an in stream construction work window from June 1 to October 1. No Class II or III wetlands are present within the project area. There are no mapped species of concern within the project area, although the entire project area is within a mapped deer wintering area. 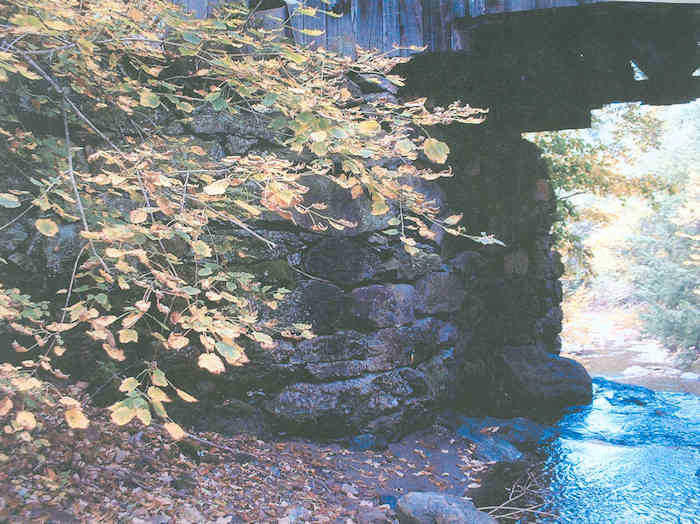 From an historical resource perspective, the project must strive to preserve the physical and structural integrity of Creamery West Hill Covered Bridge that was listed on the National Register of Historic Places in 1974. 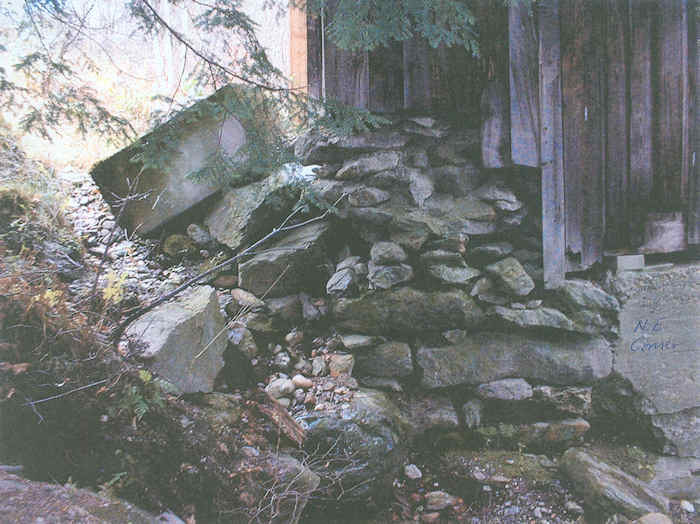 From an archaeological resource perspective, old mill foundations exist near to the northeast comer of the covered bridge superstructure, but beyond existing right-of-way limits. Return to Top Return to T.O.C. 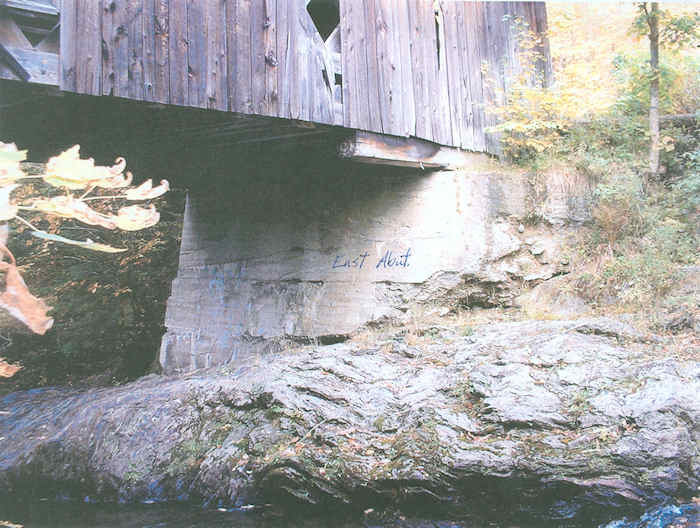 We have performed an analytical evaluation of the Creamery West Hill Covered Bridge to determine the capacity of the trusses and floor system to support gravity loads (dead weight and snow) and vehicle live loads. 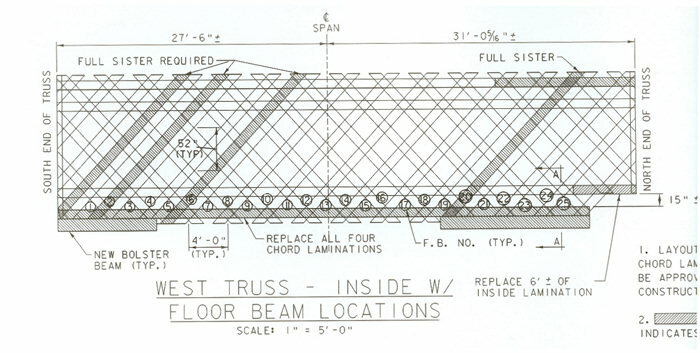 The truss members and their connections generally have relatively low stresses when subjected to dead loads, snow loads and 8 ton vehicle live loads. There is no bottom lateral bracing system in the bridge. Using some method of historical lateral bracing is recommended. The transverse knee braces are spiked on one end, but appear to function satisfactorily. A live load analysis was performed to estimate the live load capacity of a new floor system if the bridge were rehabilitated. With this configuration, a traditional timber floor beam and multi-layer plank deck would be limited to trucks with weights up to 8 tons. 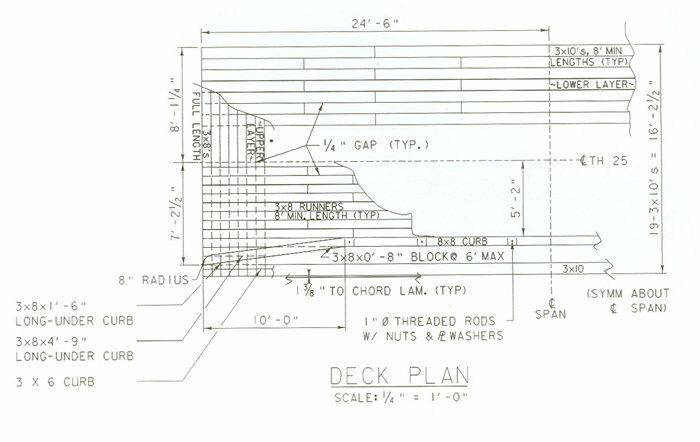 The actual capacity computed out to 8.9 tons - inventory loading - floor plank capacity governs. Although there is a potential to rehabilitate the bridge to carry higher live loads, we recommend not doing so. The bridge connects two other town roads and can be bypassed by heavier vehicles. 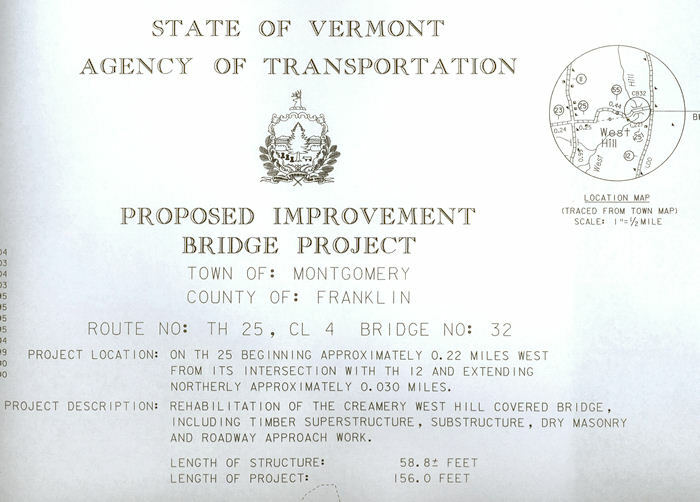 The scope of the proposed bridge rehabilitation project is based upon the principal objectives outlined in the Vermont Historic Covered Bridge Plan. These objectives include the preservation of the physical and structural integrity of the covered bridge along with maintaining the bridge as part of the existing road system to the maximum extent possible. According to this Plan, the "Priority of Use" deemed most appropriate for this bridge is "Special Use on Roads" since the floor system governs capacity. #1. Retain and repair existing historic members. #2. Replace members in kind with identical species and dimensions. #3. Apply historic methods of strengthening. #7. Reinforcement of members with non-obtrusive modem materials. #9. Replacement of members with timber of larger dimensions and different species. 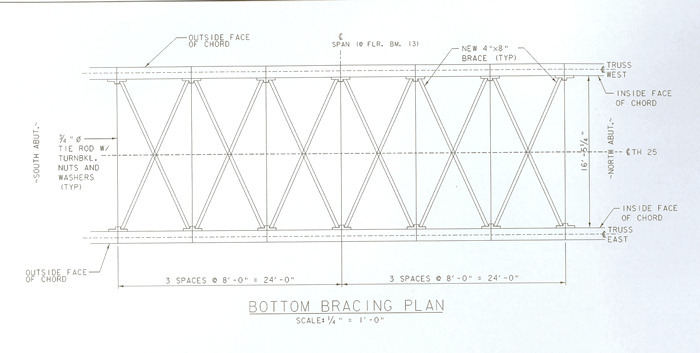 Detailed recommendations for bridge superstructure members are shown in the attached figures. These figures describe specific component conditions and suggested priority of treatments. # 1. 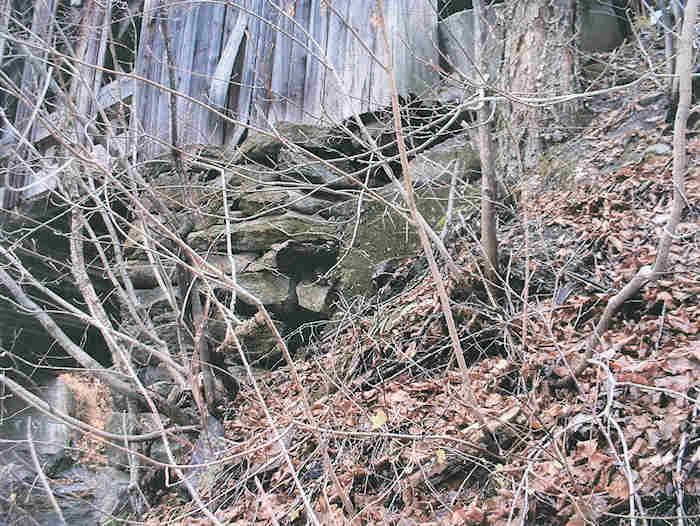 Masonry abutments shall be retained whenever possible and repaired rather than replaced. #2. If masonry abutments or portions of abutments have deteriorated to the point where repair with like-kind materials is not feasible, alternative materials may be considered. #4. Existing concrete abutments should be repaired whenever possible. Detailed recommendations for bridge substructure units are shown in the attached figures. These figures describe specific component conditions and suggested priorities of treatments. A nominal amount of approach guardrail is recommended to protect the ends of the trusses and to provide slope and river hazard protection for approaching vehicles. Weathering steel W -beam rail on timber posts is recommended. 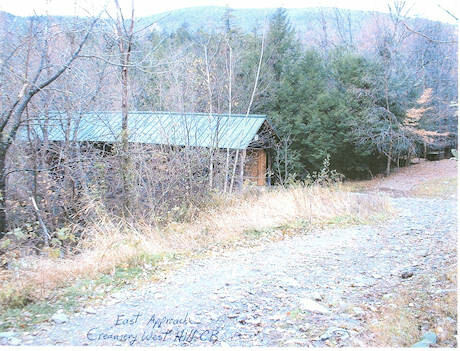 A conceptual project cost estimate for the rehabilitation of the West Hill Covered Bridge is approximately $547,000. This estimate will be updated during the Preliminary Design Phase of the project when more information is available. he present estimated average daily traffic at the project site is 30. The bridge (although closed) is accessed by T.R. 25 with horizontal curve radii as small as 24' and downgrades as steep as 15.9%. There is considerable erosion at bridge approaches due to lack of proper roadway and drainage maintenance. Approach roadways have very steep embankments in some areas and there are no signs of approach railings anywhere. There are no weight or height posting signs near the bridge area. 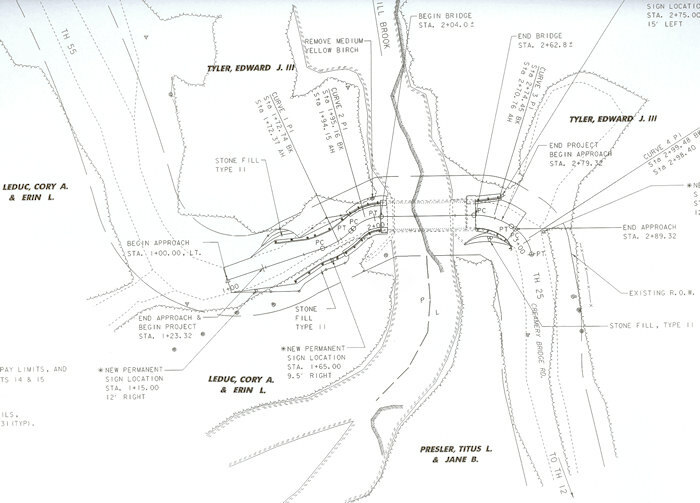 General features of the existing bridge superstructure are shown in the attached typical section. The bridge was built for an unknown live load capacity, however the existing floor live load capacity, which appears to govern, is much less than 8 tons. The roof appears to be in good to fair condition, having been replaced only a few years ago. However the siding is in poor condition and requires almost complete replacement. Bolster beams require replacement at the west abutment due to very deteriorated condition. Other superstructure and substructure components are as described in the Overview section of this report. 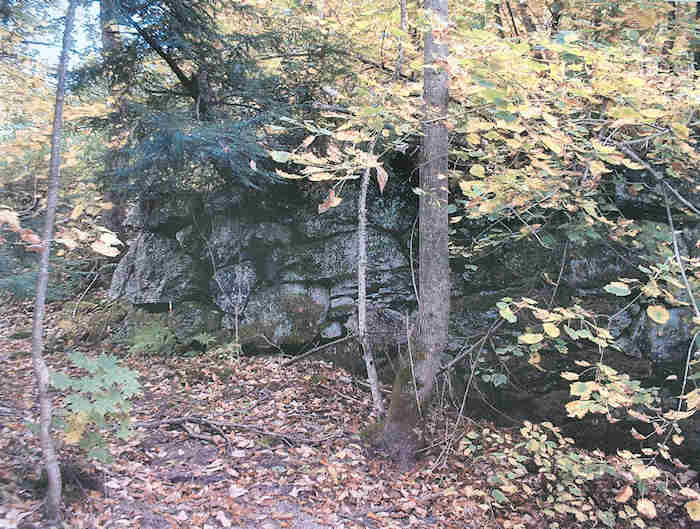 There are outcroppings of ledge along the river banks as well as in the river. 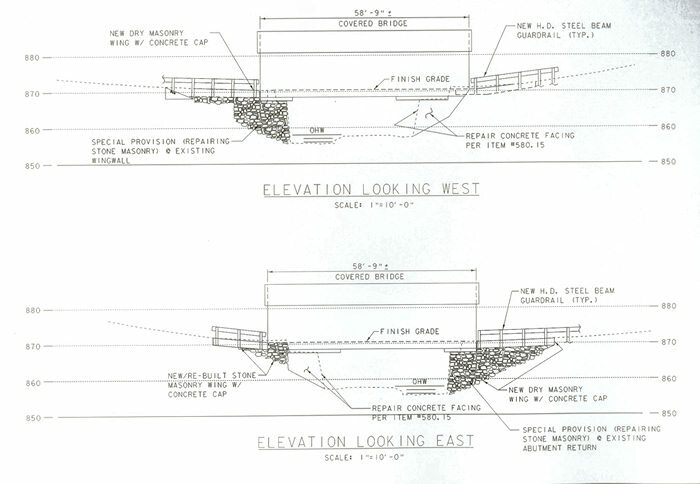 The concrete faced east abutment appears to be constructed upon ledge. Approximately 75' downstream of the bridge, there is a small waterfall that plunges to a pool below. 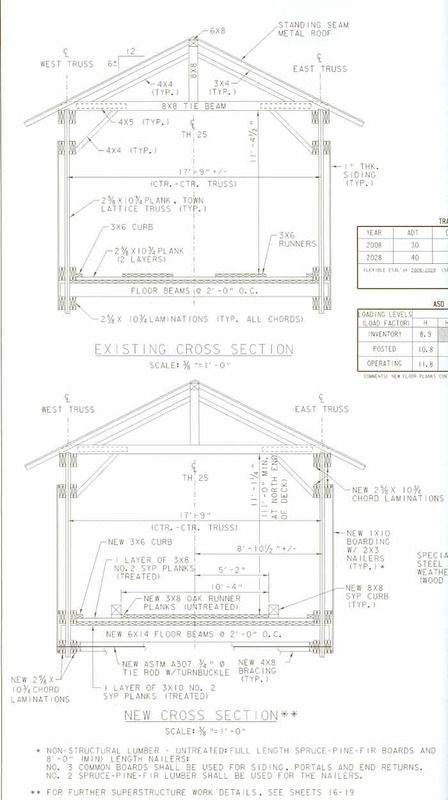 The structure has a span of approximately 35' and a rise of 13.3' , providing a hydraulically adequate opening of approximately 466 square feet. The bridge more than meets the recommended standard of having l' of freeboard at design flow. Preliminary Right-of-Way information has been obtained by the Agency. A three rod T.R.25 Right-of-Way exists throughout project limits. It appears that the entire rehabilitation project scope of work will be accomplished within existing Right-of-Way limits. The future estimated average daily traffic at the project site is 40. Vermont State Standards require 8' travel lanes and 0' shoulders for a local road with this anticipated traffic volume. The rehabilitated approaches will provide two 8' -11/2" travel lanes between new approach railings. One 10' -4" wide travel lane (between curbs) will be provided on the rehabilitated bridge superstructure. The existing T.R. 25 horizontal minimum radius horizontal curve approach is outside project limits and will not change, however, calculations demonstrate that this curve is functional for (assumed) 10 mph traffic. Vermont State Standards allow design speed less than 25 mph anticipated posted speed to avoid historical and archaeological resource impacts - this is the case here. The existing 15.9% vertical grade of T.H. 25 is outside project limits and will not change, however Vermont State Standards allow grades up to 15% in mountainous terrain. T.R. 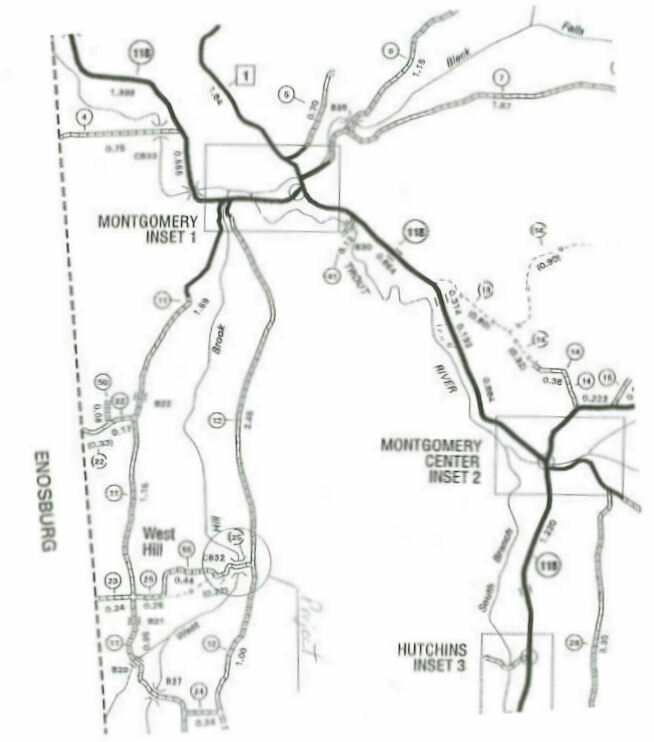 25 super elevations within project limits will be less than 6%, which meets Vermont State Standards requirements for unpaved roads. Once new approaches are constructed, existing roadway drainage features such as ditches and side channels will resume their intended function and erosion will be kept to a minimum. Proper height and weight signs will be installed in the bridge area. 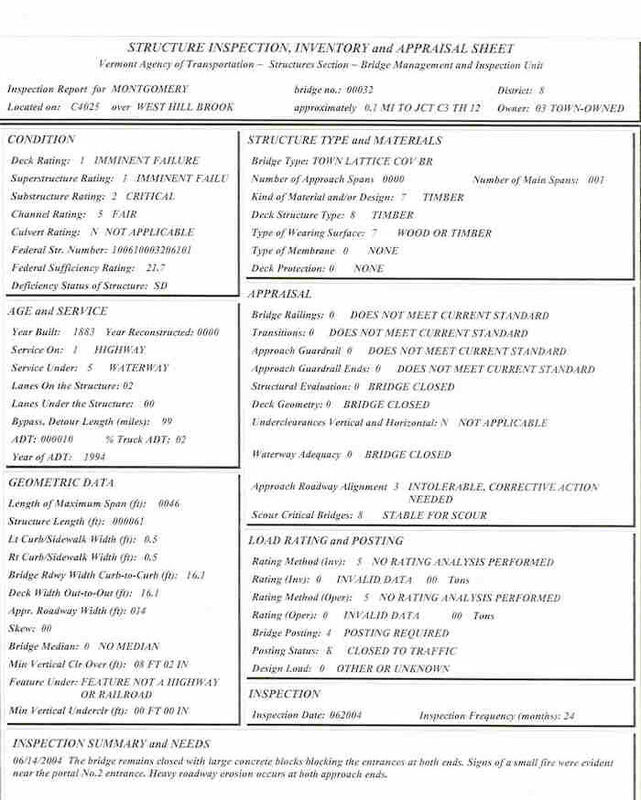 Features of the rehabilitated bridge superstructure and substructure units indicating priority of treatments are attached. The bridge superstructure is to be rehabilitated for 8 ton live load capacity - the plank floor system will govern capacity. The substructure units are to be rehabilitated to restore their integrity and to retain newly reconstructed approaches at the east and west ends of the covered bridge. A conceptual project cost estimate for the rehabilitation of the Creamery West Rill Covered Bridge is provided below. This estimate will be updated during the Preliminary Design Phase of the project when more information is available.